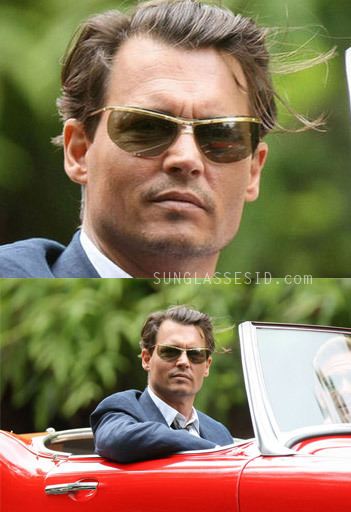 It has been suggested on a Johnny Depp fan forum (here) that these are french designer sunglasses from the 1950s. This could be the brand name Renauld, model Spectaculars, of which a pair recently was for sale on eBay which looked very similar. All we know is that the sunglasses were provided by Old Focals, a company that specializes in providing films and tv series with vintage frames. Ray-Ban also has a model with a gold browlineand temples, the Ray-Ban RB4109 Olympian.